Place all ingredients into your blender, or vitamix, in the order listed. Secure the lid. Select the slowest speed on your blender, or variable one on your vitamix and the pumpkin mixture should slowly come together. Increase the speed to highest setting on your blender. On a vitamix this is variable ten. The consistency of the latte should start to become smoother. Blend for another 35-45 seconds or until desired consistency is reached. 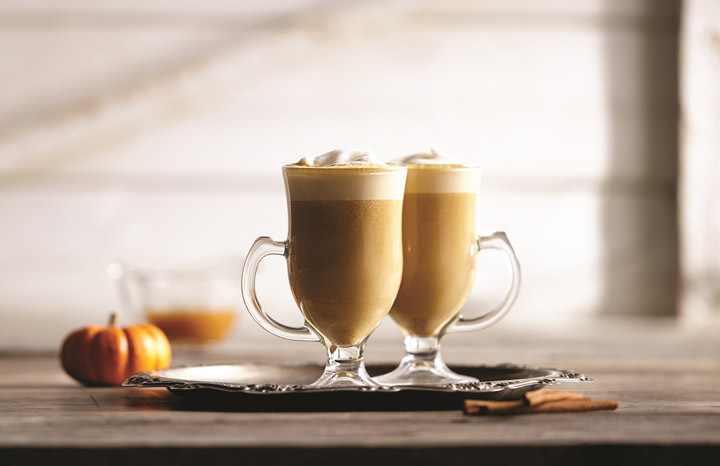 Pour out into latte glasses, then sprinkle with cinnamon on top. For more warming winter drinks, grab your latest copy of Yours, out every fortnight.